Do World Cup TV ratings mean Americans are embracing soccer? Is soccer ready to hit mainstream American culture? Or even mainstream American sports culture? After the U.S. Women’s National Team claimed their third World Cup – and after it was watched by more Americans than any soccer match in history – it’s a question worth asking, even if it has been asked before. But now, for the first time, soccer has something new in America – ratings. Is soccer ready to hit mainstream American culture? Or even mainstream American sports culture? After the U.S. Women’s National Team claimed their third World Cup – and after it was watched by more Americans than any soccer match in history – it’s a question worth asking, even if it has been asked before. Many times. Soccer was supposed to arrive in 1994, when the Men’s World Cup was hosted in the U.S. for the first time; in 1996, when Major League Soccer opened play; in 1999, when the U.S. Women won their second World Cup, Mia Hamm drank Gatorade with Michael Jordan, and Brandi Chastain became synonymous with one the most iconic images in sports; in 2004, when 14-year-old Freddy Adu was hailed was the next Pelé and vaulted into professional competition before he could drive a car; in 2007, when David Beckham eschewed European power Real Madrid to play for the LA Galaxy of MLS. We’ve been here plenty just in the past two decades. But now, for the first time, soccer has something new in America – ratings. 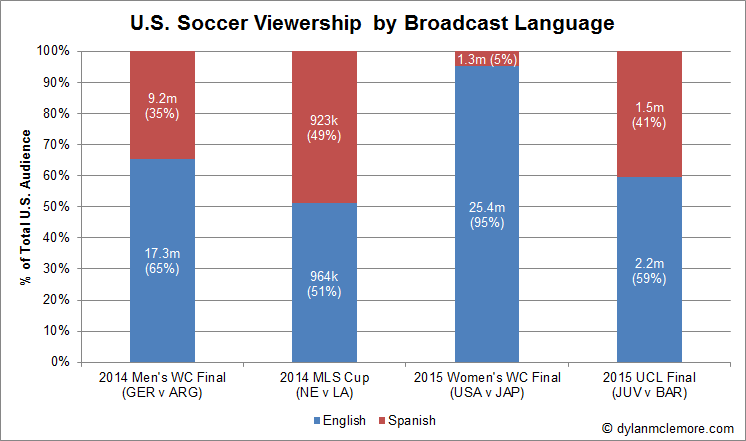 The 2015 USA-Japan Women’s World Cup Final was watched by an average of 26.7 million people between FOX and the Spanish-language broadcast on Telemundo. Typically, a blowout is bad news for ratings, but peak viewership on FOX actually occurred after the 16-minute flurry of offense by Carli Lloyd and company to open (and essentially end) the game. Nationalism loves a coronation. Viewership nearly doubled that of the most recent Women’s World Cup Final (a much more exciting match between the same two countries in 2011). In fact, the record audience placed a soccer match ahead of the NBA Finals (sitting at a post-Jordan high) and World Series, surpassed by only the NCAA Men’s Final Four and both college and professional playoffs for the unstoppable force that is American football. There’s reason to believe this was more than a flash in the pan. The previous soccer ratings record in America was set one year earlier by the Men’s World Cup Final in Brazil, when 26.5 million people watched Germany defeat Argentina. On its face, this seems a huge win for soccer – a mega-audience for a match not involving the U.S. But deeper inspection suggests that two very different Americas were responsible for the two big ratings. For the Women’s World Cup Final, the Spanish-language feed accounted for less than 5% of the total audience. For the Men’s Final, that number was almost 35%. Broadcast carriers could be responsible for some of the discrepancy. The 2014 Men’s Final was carried on Univision – the largest Spanish-language network in the U.S. Whereas Univision reaches 94 million homes and occasionally out-rates the “Big Four” English-language broadcasters (ABC, CBS, NBC, and FOX), Telemundo is less widely available (Parent company Comcast is vague regarding reach, but a 2011 AdWeek advertorial sponsored by Telemundo had their reach at 34 million homes. Still, the numbers suggest that Hispanic audiences bolstered World Cup ratings in America considerably, and that the rest of the nation became far less engaged once the Stars and Stripes were sent home. In fact, the highest rated English-language match of that World Cup wasn’t the Final; it a group play match between the U.S. and Cristiano Ronaldo’s Portugal. These splits between English and Spanish broadcasts piqued my curiosity, so I checked a few other prominent championship games and compiled the chart below. If you can accept my assumption that the majority of the Spanish-language audience are Hispanic, then you see what a large influence one of the fastest growing ethnic demographics in the country is having on soccer ratings (and that’s not counting what is surely at least some percentage of the English-language audience that is Hispanic). Though not included in the chart, I was curious if the presence of Team USA always produced such disproportionate splits in audience, so I also looked into the ratings for the aforementioned USA-Portugal match from 2014. Sure enough, the English-language feed spiked to 74% of the audience share, but the Spanish feed still garnered 6.5 million viewers (26%), making the Women’s WC Final split even more of an outlier. The past two summers have been excellent for soccer in America, but now, with the next World Cup three years away, is the sport destined to fade into obscurity again? Is there evidence that fans are engaging with leagues? Sort of. Non-World Cup soccer ratings are rising, but remain extremely small. MLS games are averaging about a quarter-million viewers on ESPN/ESPN2 and Fox Sports 1. For comparison’s sake, the average audience for MLS matches is roughly the same as the lowest rated nationally televised Major League Baseball game this season, while the MLS Cup only garners about a third of the audience of the NHL Stanley Cup. And a World Cup bump hasn’t been evident. In fact, the largest season-long MLS audience came in 2012, suggesting that demand may be higher once removed from the shadow of the world’s premiere tournament. More Americans are passing on their own league for European soccer. The audience for Premier League matches presently doubles that of MLS, partially because of showcase matches on NBC, though most matches air on the relatively obscure NBC Sports Network. In the past year, nine Premier League broadcasts topped one million viewers, and a few others came close on NBCSN, despite airing as the sun rose on weekend mornings. The UEFA Champions League Final between Juventus and Barcelona in June drew a combined U.S. audience of 3.7 million people on FOX and FOX Deportes. Those are the numbers. How do we forecast the future? Let’s look at the game and how it’s watched. Communal Experience – Watching the U.S. compete in the World Cup was fun because it was quite easy to not do so alone. Viewing parties took place at restaurants and bars, but also in city centers, stadiums, and arenas. One can find similar scenes on most college football Saturdays, but for the World Cup, the social aspect seemed to be more important. Maybe it’s because of nationalistic pride versus team pride. Maybe we just don’t know enough about soccer to enjoy it apart from good company. Maybe it’s what we perceive as the social norm. Unlike others sports, we didn’t feel the need to gather friends at our homes as much as we felt the need to go out and watch with both friends and total strangers. Whatever the motivation, that type of outward expression is great for the sport… I’m just not sure it will maintain outside of the World Cup setting. Pace – The most common international complaint about American sports is that they are notoriously slow. You may be thinking of baseball as the principle culprit, but American football is just as bad. This oft-cited Wall Street Journal piece found that each 3-hour NFL game consists of about 10 minutes of action. The rest is spent huddling, reviewing calls, and, of course, airing advertisements. Soccer’s pace is more constant than anything we have to offer. Its 90 minutes of gameplay takes one-third less time than 60 minutes of American football and one-fifth less time than 48 minutes of basketball. We could wrap up two World Cup matches with time to clean the stadium before the Red Sox and Yankees complete one of their soul-crushingly slow baseball games. Soccer’s action is constant and its game brief. Demographics – We’ve already talked about the advantages of having a dedicated Hispanic audience as population trends continue. But that’s not the only key demographic card soccer has going for it. The 2014 World Cup audience was younger than the audience of any other major sporting event, from league championships to the Olympics. Social media participation was outstanding (more outward expression). The median age grows a bit for other soccer broadcasts, but remains young. We’ve heard about the youth soccer movement for decades now. Since the 1980s, kids have grown up playing, and we’re told that’s going to translate into adult fans. Well now, those kids make up the highly sought-after 18-30 demographic. That may be soccer’s biggest asset, because it’s what’s going to encourage media companies to invest more in the game. Pace – Some of these pros are part of the same game structure that presents problems for the growth of the game in America. I’m only partly talking about the clock. Yes, it bewilders us that FIFA can’t afford a clock operator to stop the thing when a player flops is injured instead of adding stoppage time at the end of a half. Eh, but we’ll adjust, because the game action just keeps on going. No breaks! But therein lies the stumbling block to soccer’s continued success stateside. Those media outlets who are gaga about young audiences only feel that way because of the advertising revenue they can generate. Soccer does not block off room for television advertisements. Once the ball enters play, commercials are absent until the end of the 45-minute half. The behemoth NFL, on the other hand, plays a block of commercials after a scoring play, comes back for a kickoff to the opposing team, then takes another commercial break before the next possession begins some 7-10 minutes after the scoring play. If this truly is the moment that soccer catches on in America, it will soon be followed by the moment that MLS incorporates media timeouts throughout its game – after goals, at set times throughout gameplay (like in basketball and hockey). Or at least obnoxious side-by-side ads like in motorsports. In-game branding simply doesn’t provide the same sort of revenue. Even if this restructuring happens, it definitely won’t extend to FIFA or the European leagues, which don’t need the added exposure. Game Play – Should we be concerned about scoring? The exuberance of fans watching the frenetic opening moments of the Women’s Final will surely wain as they realize it usually takes four entire matches to see as much scoring as they witnessed in 15 minutes. It’s almost ironic that the American men’s aspirations rested on Tim Howard, a keeper who kept the nation in the tournament only by preventing high scores. I recognize that most Americans would probably prefer more shootouts, mandatory steroids in baseball, and anything to help their fantasy quarterback score more touchdowns. I don’t personally fall into this camp. In fact, I hate shootouts. Games, especially in a championship tournament, cannot be decided by changing the rules. The NHL abandons shootouts for its postseason, and adopts continuous overtimes. Soccer players who have been running for 90 minutes can’t do that, you rebut. Perhaps, but there’s got to be something better than transitioning from an entire game in which it almost impossible to score to a bonus round where players stand a few feet from a gigantic net and score almost at will. But I do like scoring chances. Back to Howard – The U.S. Men’s team was fun to watch because their poor defense allowed so many shot opportunities. We enjoyed watching our superhuman keeper stop the barrage coming his way. But a scoreless game with 12 shots on goal is a lot different than one with 2 shots on goal. And from an admittedly novice point of view, the best soccer clubs in the world tend to play an excruciatingly boring style of defensive keepaway that eliminates even the possibility of a scoring chance. That’s going to be a tougher sell. Time Shifting – The best soccer will continue to be played abroad, which creates problems for attracting a television audience. American World Cup viewership jumped 40% in 2014 over the previous Men’s World Cup in South Africa, while WWC viewership ticked up 21% in 2015 over the 2011 tournament in Germany. Part of that is probably due to increased interest, but part of it is also better time slots for live games taking place in Brazil and Canada. Sport is about the only thing we have to consume live, and when live means morning to early afternoon because the stadium is eight time zones ahead, you miss out on a big primetime audience. That’s part of what makes EPL and UEFA ratings that much more impressive. Could soccer broadcasts time shift into primetime (a fancy way of saying “show it on tape delay”)? It’s what NBC does for the Olympics, and the pre-packaged narrative style works well, even when the results are out there for people to find. But I think these are two different audiences. The Olympics attract casual-to-non-sports fans who are in it more to see the pageantry and success stories of their country. The packaged presentation works because it is more human interest, less sports. Soccer deserves a more mainstream comparison – would you get the same enjoyment DVRing a college football game as watching it live? And how would that change if you happen to overhear the outcome before you get to watch? I started writing this piece in 2014, put it down for a year, and now have pushed it over 2,000 words. We’re well into added time at this point in the game – time to come to a conclusion. Is soccer ready to hit mainstream culture? Yes, if we’re talking about an Olympic model. Once every four years, we catch futbol fever and lose our minds cheering for our flag. The past two World Cups have proven we love cheering for our Men and our Women, our underdog and our dynasty. Beyond that? The demographics are favorable for growth, but the logistics involved in airing live international broadcasts of essentially commercial-free entertainment are going to continue to be stumbling blocks for the sport moving forward. Then again, the media theorist in me believes that media only set the agenda to a certain extent. If enough people demand a sport be covered, the monetization will take care of itself, and perhaps 2015 won’t be just another bulletpoint in a long list of moments when soccer almost made it in America.